Samuel Beckett was not a playwright who catered to audience whims. His works are difficult to understand, bizarre, wordy, repetitive, yet riveting. Nobody else writes like Beckett, and, with effort, nobody satisfies in quite the same way either. He deals with existential questions and does not believe in sugar coating his bitter pills. Yet, paradoxically, few playwrights are as wickedly funny as was this dogged Irishman. Carey Perloff’s production of two Becket plays, the rarely seen Play and the widely known Endgame does not achieve the full potential greatness of these works, but gives us some fine performances, intelligent staging and a satisfactory time at the theatre, especially for Beckett aficionados. The evening’s opener, Play, gives us three actors (a man and two women) in what appear to be funeral urns, with only their heads visible. They begin to speak simultaneously, incomprehensibly, full of emotion. After a moment, the light goes out. Then each actor is picked up by individual spotlights that rapidy shift from one to another. They deliver brief speeches, at an astonishingly rapid pace, gradually unveiling the story of a marriage torn apart by adultery. The details are difficult to grasp, particularly given the high speed performance. The language is elusive, repetitive, poetic, communicating as much by sound as by content. We are left with the impression of three people locked together forever (are they in the afterlife?) in a replay of their emotional interdependency, repeatedly going around in circles, never arriving. And then it stops. This is not typical fare, of course, and some will find it merely puzzling. But for those who have a taste for the obscure and a tolerance for poetic language that may obfuscate as much as it reveals, this packs a solid emotional wallop. The three actors (René Augesen, Annie Purcell and Anthony Fusco) are all excellent. Hamm (Bill Irwin, left) and his servant, Clov (A.C.T. 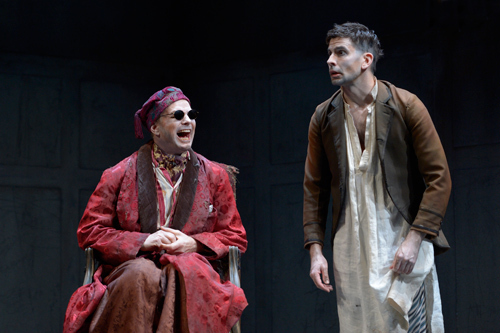 core acting company member Nick Gabriel), in Samuel Beckett’s “Endgame”, performing together with Beckett’s one-act “Play” at the American Conservatory Theater through Sunday, June 3, 2012. Photo credit: Kevin Berne. Endgame is more accessible, but equally eccentric. Hamm (Bill Irwin), bitter and bound to a wheelchair, is cared for by his servant Clov (Nick Gabriel), barely able to walk himself. These two also care for Hamm’s extremely aged parents, Nell (Barbara Oliver) and Nagg (Giles Havergal) who are kept in lidded trash cans and only occasionally permitted to poke their heads out for food. As these four absurd figures banter and abuse one another, we gradually realize that they are living in a post apocalyptic world. There are no other people and the food is nearly gone. Their personal deaths, the death of the world, the end of time—all this is imminent. They have no choice but to play out their Endgame with one another. Few actors are as capable as Bill Irwin to distill comedy from these unlikely circumstances. His eccentric Hamm will definitely make audiences laugh and squirm. He is more than ably supported by the other cast members. This is a true ensemble. Audience appreciation will be greatly enhanced by the publication “Words On Plays”, available at the theatre, which includes several enlightening essays by director Carey Perloff and A.C.T.’s dramaturgical staff. Play and Endgame continue at A.C.T. for a limited run through June 3, 2012. For further information, click here. “Play” and “Endgame” by Samuel Beckett, produced by A.C.T. Director: Carey Perloff. Scenery: Daniel Ostling. Costumes: Candice Donnelly. Lighting: Alexander V. Nichols. Sound Design: Fabian Obispo. W1: René Augesen. M: Anthony Fusco. W2: Annie Purcell. Clov: Nick Gabriel. Nagg: Giles Havergal. Hamm: Bill Irwin. Nell: Barbara Oliver. Posted in Reviews.Tagged A.C.T., Alexander V. Nichols, Annie Purcell, Anthony Fusco, Barbara Oliver, Bill Irwin, Candice Donnelly, Carey Perloff, Daniel Ostling, Endgame, Fabian Obispo, Giles Havergal, Nick Gabriel, René Augesen, Samuel Beckett.